very lovely! I love these soft colouring! This is adorable! :)Love the colours! This is really a nice picture and idea! Like the tender autumn colours! Oh my goodness! I absolutely love this. Your working is wonderful. The colors are amazing. I'm going to follow your blog. Love yours and thanks for your comment. Just simply adorable...I imagine her riding off somewhere fun...love the autumnal colors, too! good luck with your etsy shop! As wonderful as ever Kathy! I love her stripey socks! Kathy, I am so in love with your work. Your color sensitivity is amazing. I love the expressiveness and softness you achieve with your medium. This is absolutely divine. I can't wait to see your Shop! Would love to hear about the process setting up the Etsy shop. Such a lovely illustration. The whole thing has a very old-fashioned feel! She is wonderful! Thanks for sharing. This is so beautiful! Love the light, the soft colors in the background, and, of course, the concept and character! Absolutely wonderful! Hello fairy pencil ..... always find wonderful surprises here .. beautiful image. Very nice Job..You are very talented! this is fantastic- I love the way her hair flows out of her hat- and her striped leggings. Oh its just beautiful!! I love your style of work, your characters are wonderful! You have so much detail in your illustrations and the colours are so nice and warm. Kathy, your work is so magical and dreamy. This little girl is just delightful to look at over and over again. Hey Kathy! I was very excited to see that you posted this week... and my excitement turned to complete joy when I opened your page. This is my favorite illo this week... this month... this year!! You nailed the theme, the era and the illustration!! Bravo Kathy! Wow you've been busy - so many prints!! They are all just divine Kathy, I'm sure your Etsy shop will be a huge success for you! Lovely picture! The muted colors match the season beautifully, and the girl is so serene! Beautiful, beautiful! Oh, clap clap clap clap clap!!! Love the richness of the blue. LOVE those old fashioned bikes and wish they'd come back. That is a darling hat and wonderful stockings. And YAY! You have a gorgeous etsy shop!!! How wonderful. I love the light colors and the over all softness. congratulations on your shop, it looks wonderful. 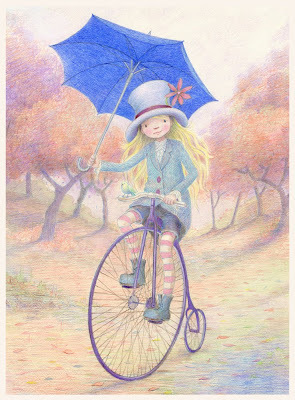 this is such a charming piece, I love the colors, the bike, the umbrella. Oh be still my heart! How MAGNIFICENT!!!! You Kathy darling, just steals the show with each and every wonderful illustration that you bring forth. It's always brilliant and amazing! Thanks so much for you kind words left on the blog for my birthday. Hug to you. Dreamy! Your use of colors never ceases to knock my socks off! what a amazingly beautiful illustration! Great for the word! I have chosen you for an award! You have been a wonderful source of inspiration! You may check out my blog to see if you wish! Your work is absolutely incredible! I really love it. Bravissima. I Love your art. I am checking out Illustration Friday and hope to get up the "nerve" to enter sometime!